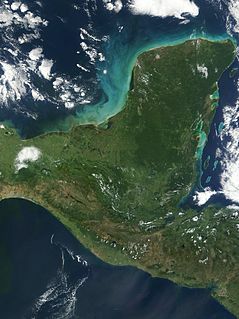 The Yucatán Peninsula (Spaingie: Península de Yucatán), in sootheastren Mexico, separates the Caribbean Sea frae the Gulf o Mexico, wi the northren coastline on the Yucatán Channel. The peninsula lies east o the Isthmus o Tehuantepec, a northwastren geografic pairteetion separatin the region o Central Americae frae the rest o North Americae. This page wis last eeditit on 24 Julie 2016, at 17:49.